To put this in perspective, consider that the first Wi-Fi effectively used 3 channels (in the 2.4 GHz band) to stay away from using the same channel as the neighbors. Today, “modern Wi-Fi” uses 40 MHz-wide channels and effectively supports 10 of those channels in the 2.4 GHz and the 5 GHz bands, making it not only easier to stay away from the neighbors, but also to optimize usage in a home by enabling different users using different channels and also allowing a wireless infrastructure in the home for distributed Wi-Fi with multiple access points. If talking about different channels in Wi-Fi makes it sound as simple as digital radio and changing channels with a push of a button, the reality is a little harsher. Cheap Wi-Fi radio technology causes easy bleeding from one channel into another, particularly when using high or maximum output power. This bleeding effectively kills the neighboring channels, drastically reducing overall capacity. But wait, is this really a problem? If it stays in the room, that means it does not interfere with the usage of the same channel/frequency in the other rooms, much less the neighbors. Sounds kind of ideal, doesn’t it? One may really wonder: if 60 GHz 8011.ad has existed for years, why hasn’t the market jumped on it yet? surprise that in this context, the expectations for the tens of Gb/s (IEEE 802.11ay) should not be too high. Higher data rates to the end nodes are great, but if the infrastructure does not support it, then what’s the point? As we’ve discussed, it’s getting access to the home with 1 Gb/s that is the current challenge. Although the first rollout of 10 Gb/s DOCSIS 3.1 has started, most people are still working with 100 Mb/s or less. This means that at this moment there is clearly overcapacity with all the infrastructure inside the building and the end nodes raw data rates today exceeding 1 Gb/s. We can also ask the reverse question: when does 7 Gb/s with 802.11ad in the phone or in a tablet start making sense? Well probably if the in-home infrastructure can handle 15-20 Gb/s and the access to the home is 30-50 Gb/s. Well… that probably is going to take a while, unfortunately…. Let’s look at an example. Someone interested in the news has a subscription that downloads all the news articles and video clips at 6 AM to her local router/server. She can browse during breakfast at 8 AM, going through the news and watching clips at incredibly high speeds and without delays. The bottleneck of getting information from the Internet has been removed. The router/server has become a traditional mailbox, in essence, and the news is kept up-to-date in her mailbox (router/server) all during the day. It is clear that such an architecture overhaul would be a tremendous undertaking, but it may nevertheless be a cheaper solution than rewiring all the exits from the high-speed Internet freeway. Certainly cheaper for the network providers, because in this situation the consumer will pick up the tab – either by paying for the more sophisticated edge-router and/or paying for the subscription for “edge routing” services. IEEE 802.11ax, the emerging new Wi-Fi standard, will first appear in distributed Wi-Fi systems, as this is the first place for traffic aggregation and would benefit from higher data rates the most. IEEE 802.11ax for end nodes will stay more of a marketing game for a while, because the infrastructure to support the higher data rates will not be there. 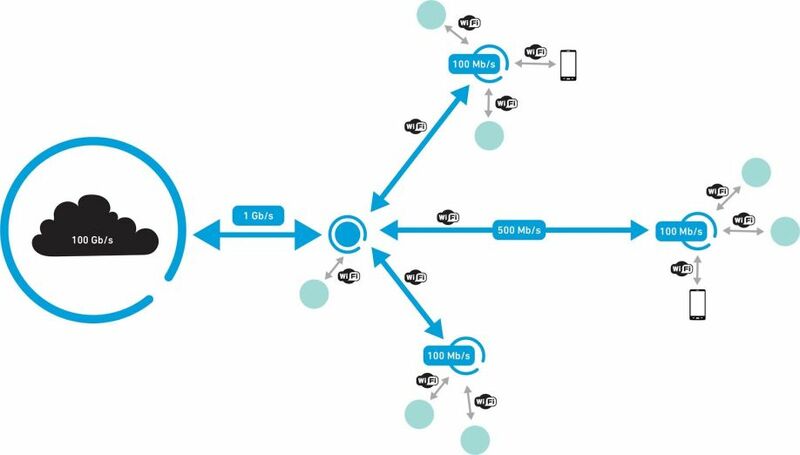 It looks like for end nodes IEEE 802.11ac will be the right choice for quite some time, avoiding the .11ax complexity and relatively small benefit. 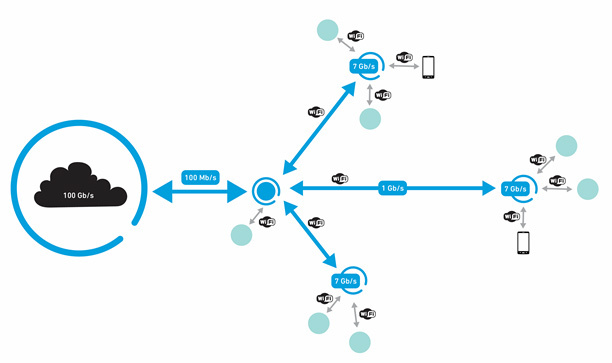 Even for lower performing end nodes, 802.11n will be a good solution for a while. We need a successor for IEEE 802.11ax for increasing the bandwidth of the indoor distributed Wi-Fi infrastructure. 15-25 Gb/s would be a good target. 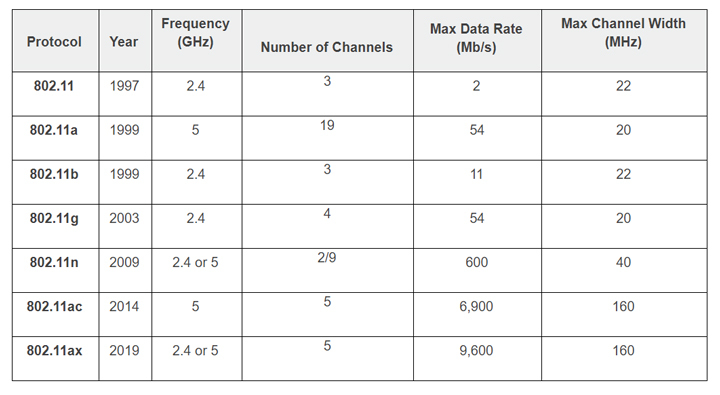 The goal should be to make 60 GHz IEEE 802.11ad relevant; maybe by defining that role for IEEE 802.11ay. The DOCSIS 3.1 FD local loop coming to our homes providing higher speed access will make tremendous improvements to what at this moment is the real bottleneck.